Operation Christmas Child is THIS WEEKEND!!! Home/Events/Operation Christmas Child is THIS WEEKEND!!! This Sunday, November 18th, we will be packing hundreds of shoeboxes full of toys, school supplies, hygiene items, and love, as part of our morning worship service. Here’s what we are asking of you. First, pray for this ministry and get excited. Your gift will have an eternal impact on those who receive it. Second, get a list of items and start shopping. Pay careful attention to what items may be included this year. Bring your items with you to PPES this Sunday! We will be setting up early on the morning of the 18th and could use your help. Please contact Stacy Davidson (sdavidson@lifechurchcalvert.com) if you are able to volunteer. Third, be sure to invite some friends to come be a part of this very special Sunday. It’s one of the highlights of the year and everyone can participate. Fourth, please consider donating $9 to cover shipping and handling for your shoebox. To simplify things you can donate online directly with Samaritan’s Purse, print out a tracking number and attach it to your box. Or, you may write a check to Life Church and place it in the offering basket and we will make one payment to Samaritan’s Purse. Please do not place a check in the box. We don’t want to have to go through 100s of boxes in search of checks for Samaritan’s Purse. And finally, be there on the 18th and let’s have some fun serving in Jesus name! 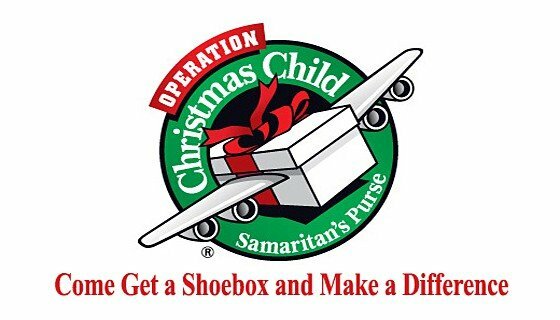 For more information about Operation Christmas Child visit Samaritan’s Purse here.